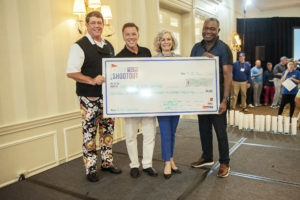 United Way of Central Carolinas, along with co-hosts Bank of America, BB&T, and Wells Fargo, celebrated another successful Hi.Tech Shootout this year, raising over $1.24 million on October 22 at Carmel Country Club in Charlotte. This year, the event drew more than 240 golfers to the greens to enjoy a bit of friendly competition during the tournament for technology vendors and bank executives. Hi.Tech Shootout is the single largest golf fundraiser for any United Way in the country – raising a total of $17 million for our organization over the past 19 years. *Over 200 host and sponsor executives attended a networking reception for premium sponsors at The Vista at Duke Energy. *More than 55 IT vendors sponsored this year’s event. *For the first time, we held a special pre-reception for Title, Gold and Platinum Plus sponsors. *We had golf ball blasters provided by Charity Golf Guns, giving players the chance to take their best shot. *Pro golfers and long-drive champions David Mobley and Brian Pavlet entertained and dazzled golfers with their amazing skills during the “Buy-a-Drive” stations. Congratulations to this year’s victors! South Course – Robin Tarkenton and Steve Emmons with BB&T, Steve Bennett with Wells Fargo, and Jay Brockhoff with BB&T. North Course – Robin Stuart with Bank of America, Rolfe Hughes with Accenture, and Steven Sherck and Ray Chinn with Bank of America.